The British Royal Family, who exist primarily to own land and outlive other heads of state, threw a banging party this weekend. There were military uniforms, horses, and a gospel choir singing “Stand By Me.” There were also gift bags. Which are now going on eBay for over a thousand in US dollars. Normally a gift bag going for big bucks online would make you think of those ones rich people recieve at the Oscars full of like, diamonds and iPhones and gift certificates to Neimans. The gift bag from Harry and Megan’s wedding is not that plush. Instead Oprah, Serena Williams, Gina Torres, and Amal Clooney’s husband received a bottle of water, shortbread, a picture of the couple, 20 percent off coupon to the Windsor online gift store, a fridge magnet, and a giant commemorative chocolate coin. That’s not even a good gift bag by traditional wedding standards, let alone ROYAL wedding standards. I mean sure, the image of David Beckham gnawing on a chocolate coin as big as his fist is a delight, but where are the tiny bottles of booze! The hangover cure kit! The keychains! Where is the t-shirt with an ironed on picture of their faces? 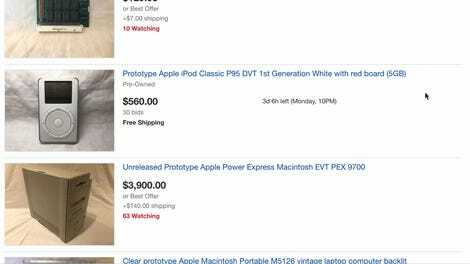 So far there are only two bags available on eBay, with the first one listed going for over $1,100 at the time of this posting. While you might assume these are being listed by those land rich money poor aristocracy Downton Abbey warned us of (or Oprah), there were, according to The Cut, over 1,200 members of the general public who received the bag as well. So provided they didn’t go H.A.M. on the shortbread one wouldn’t be surprised to see a few more bags pop up online over the coming days.